Posted by carolhagen in Facebook. Bing loves Facebook more than Google these days. If you haven’t noticed, Bing displays Facebook profile pictures in their search results using Facebook’s Instant Personalization Notifications so now you can we see all your connections to the right of the regular search results. This is great if you think your friends tastes match yours but you need to think about it from your business friend’s point of view – as a tool for branding you and your comapny – construction or otherwise. Bing will display your Facebook friends “likes” as it pertains to your search. This is wonderful for TV Shows, restaurants, movies and music thanks to Pandora, Yelp, Rotten Tomatoes and Clicker. But there’s more to it. With Docs.com and Scribd businesses and entrepreneurs can extend their search reach and position themselves as experts with original content. What am I suggesting to the AEC industry? Architects, Engineers and Homebuilders that cater to the homeowner and are using Facebook need to get on board! You may also want to think about whether you wish to opt out of certain applications. Here are good instructions from the Electronic Frontier Foundation on how to opt-out…yes it is one application at a time. Again Facebook makes it cumbersome to keep your privacy private. Bing people searches will also provide recommendations for people you should friend in Facebook. Will this increase visits to profiles? Absolutely! It will also expose you to more ads, but as a public speaker discussing social media topics I’m hoping it leads to more opportunities. I’d appreciate it if you “like” this on Facebook. You may be interested in reading how Google loves LinkedIn. 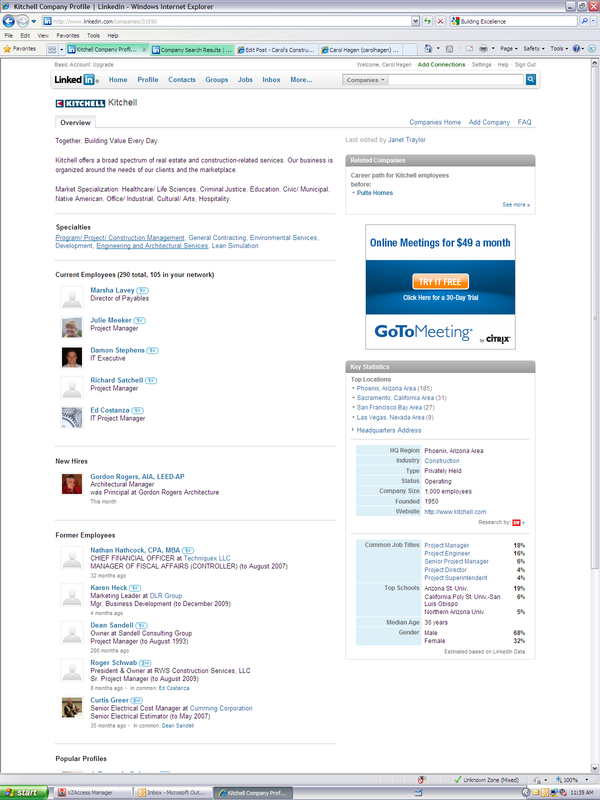 LinkedIn is the social networking tool of choice in the United States business to the business world. At the National Association of Women in Construction (NAWIC) Region 8 Forum this week I shared this fact along with just how much Google loves LinkedIn. If you haven’t noticed, the advanced search function within LinkedIn and how the contents of company and personal profiles rank high in Google search. So many LinkedIn users just don’t realize the opportunity or how to optimize their profile to increase their brand recognition and effectively showcase their expertise. I thought I’d share a few tips and encourage you to get yourself educated on what LinkedIn has inside. You should also add keywords in your Websites section (by using the “other” option), Profile Summary, Work Experience and showcase your work using the many choices in the applications directory (found under the More Tab). If you are a business owner and do business with business, not only should you have a website (and list it in your profile, you should also create a Free LinkedIn Company Profile. It adds a backlink to your website, adds another impression of your firm and can include all your employees (on LinkedIn) in your company profile (detail of how employees are associated with company profiles). Why not look professional to professionals in LInkedIn? Take time to review all the details that LInkedIn can compile from the profiles of employees at Kitchell Construction and you’ll soon understand what the value is. An often overlooked option is to embed a blog or presentation into your profile. Adding your blog to your profile can be done easily with either the WordPress or Blog LInk application. Just follow the prompts to install and make sure you check the “display on my profile” option. Blogs help to share your interests explain your passion and reveal your willingness to share. Sharing builds trust and stronger connections with your LinkedIn connections. The Slideshare or Google presentation app can be used to drop a powerpoint into your profile. Videos take a bit more work and can make more impact than any other medium. It provides the viewer with a stronger connection while showcasing your work. For those of you that are great on camera and have something to share that they are truly passionate about, video will separate you from the pack. Google presentations is the app you’ll want to use to embed a YouTube video into your profile. Once you have the video in YouTube, with sound, tags, captions, etc, it will require 5-10 minutes to embed it into your profile. Jonathan Cover shared this video, “How to embed video into a LinkedIn Profile”, providing step by step instructions that even the computer challenged can implement themselves. Have I changed your way of thinking about LinkedIn and are you implementing these suggestions? I’d love to hear from you about your successes and keep on improving your brand.